Transfer to jetty to board the cruise ship RV Bengal Ganga. Lunch onboard. Post lunch embark on an Orientation Tour of Kolkata, which will take us to the Dalhousie Square that houses several Colonial/Heritage monuments like Writer’s Building, General Post Office, High Court, Raj Bhawan (Governor’s Palace), Town Hall, Council House, Treasury Building and the Reserve Bank of India. We then visit St. John’s Church and the Victoria Memorial for a photo stop and walk in the gardens. St John’s Church, originally a cathedral, was among the first public buildings erected by the East India Company after Kolkata became the effective capital of British India. It was modeled according to the St Martin-in-the-Fields of London. The Victoria Memorialis a grand marble building built during 1906-1921 in the memory of Queen Victoria (1819–1901). The Memorial lies on the Maidan (grounds) by the bank of the Hooghly River. 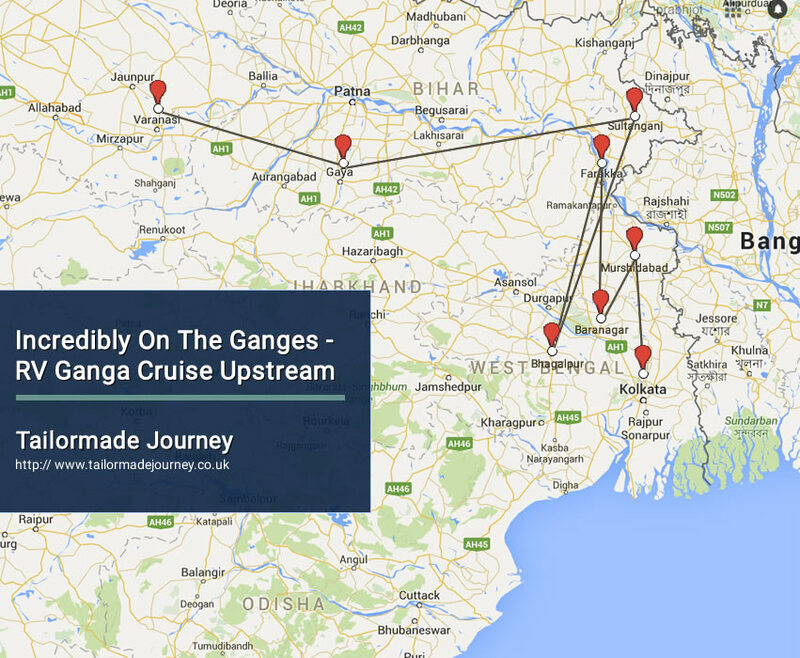 This morning we start our upstream journeys towards Kalna sailing through the areas where the different European settlers had established their respective East Indian Companies leaving back reminiscence of their settlements during the period of 17thto 19thcentury. Sail past Chandernagore,which was established as a French colony in 1673, when the French obtained permission from the Nawab of Bengal, Ibrahim Khan, to establish a trading post on the bank Hooghly River. Bengal was then a province of the Mughal Empire and Chandernagore became a permanent French settlement in 1688. Arrive at Kalna by the evening and moor for the night. Morning we take rickshaws to visit the enchanting Rajbari Templecomplexin Kalna. The temples of Kalna take elements from mosques and temple architecture to create a new congregational space of worship.On one side of the road lies the Nabakailas Temples. Built in 1809 by the Bardhaman Maharaja, it contains 108 ‘aat-chala’ or “eight slope-roofed” Shiva temples arranged in two concentric circles. The outer circle consists of 74 temples of alternate black and white lingams; while the 34 temples of the inner circle have only white lingams.On the other side of the road lies a walled complex, containing the most diversified form of Bengal’s temple architecture: Pratapeshwar Temple, contains terra cotta plaques depicting themes of Hindu epics and mythical life of saints, gods & goddesses and various aspects of day-to-day life. The other notable temples here are the Lalji temple, Krishnachandra temple and the flat roofed temple of Giri Govardhan. Return to the ship and cruise towards Matiari sailing past the religious town of Mayapur. Quintessentially a temple town, Mayapur is the headquarters of the Krishna Consciousness Movement “ISKON” and the birthplace of Sri Chaitanya Mahaprabhu, born in 1486 AD and considered as an incarnation of Lord Krishna. The town is situated on the banks of the confluence of the Ganga and the Jalangi rivers. Early in the morning we will visit the village of Matiari, which is famous for its work in brass and copper. Here copper is still processed manually. The unique character of the area is that as we start walking towards the village, we can hear loud noises of beating metal coming from all the houses. Stroll in the village and visit some homes to see and experience the different process of the brass making with a chance of buying artifacts and souvenirs. Return to the ship, cast off and cruise towards Murshidabad sailing past Plassey,which is well known for the battle that took place in 1757 that turned the history of India. The battlefield of Plassey is where Robert Clive of British East India Company defeated the Mogul Nawab, the then ruler of Bengal and his French Allies; establishing the company rule in India which expanded over much of South Asia for the next 190 years. Arrive at Murshidabad and moor for the night. Morning excursion of the historic town ofMurshidabad. We take the local Tonga (horse cart) to visit the oldest mosque of this town the Katra Mosque built by the first Nawab of Murshidabad, Nawab Murshid Quli Khan in the year 1724-25. From there we ride the Tonga to the Hazarduari Palace Museum. Built during the reign of Nawab Nazim Humayun Jah (1824-1838 AD) by an English architect, Duncan McLeod following the Greek “Doric” style. The palace has more than a thousand real and false doors in the vast corridors. Inside the palace museum one can observe a wide collection of antiquities including various kinds of weapons, oil paintings of Dutch, French and Italian artists, marble, porcelain & stucco statues, are manuscripts and palanquins mostly belonging to the 18th-19th centuries. Opposite to the Palace is the vast Imambara open only during the religious ceremony time. Walk back to the jetty and continue the cruise to Baranagar.In the mid-17th century, the royal family of Natore (now in Bangladesh) built a riverside palace in a village and called it Baranagar (meaning big town).The Dutch merchants also had homes here. Streynsham Master who visited the area in 1676 spoke of the hog factory where about 3,000 hogs a year were slaughtered and salted for export. At Baranagar we will walk through the village and visit the Char Bangla Temple complex, which was built by the famous Queen of Natore, Rani Bhavaniduring 1714-1793. The word “Char” means four and the complex is a quadrilateral configuration of four temples. These brick-built temples represent the “Jor Bangla” style of Bengali temple architecture, which involves two structures that resemble the traditional village huts of the region, one that serves as a porch in front and the other serves as a shrine. Scenes from the Hindu epics are depicted on the walls of the temple in terracotta. Return to the ship and sail onwards to Jangipur and moor for the night. We will cast off in the morning to reach the historicFarakka Lock Gate, which was built during the years 1963-75.The travel through the Feeder Canal will give us a chance to see the different birds of the region. After crossing the lock we cruise through the connecting canal to the Ganges revealing vast panoramas. We can also see the Farakka barrage at a distance, which regulates the Ganges water into Bangladesh and India. Full day sailing towards Bateshwarsthanwe cruise through Manihari, a small border town between the Indian states Jharkhand and Bihar and an area rich in bird life. Large flocks of water birds including common cranes can be seen here. Arrive at Bateshwarsthan and moor for the night. Morning ride in jeeps/cars (about 15 minutes) to the excavation site of the Vikramshila University and walk around the ruins.Established by King Dharampala in late 8th or early 9th Century A.D. Vikramshila University was one of the two most important centers of Buddhist learning in India during the reign of the Pala dynasty along with Nalanda University. Vikramshila was one of the largest Buddhist universities having more than one hundred teachers and about one thousand students. Subjects like theology, philosophy, grammar, meta-physics and logic were taught here. After breakfast we sail towards Sultanganj,which is conspicuous for two great rocks of granite, one of which on the river bank is crowned by a mosque. The second and larger one is occupied by the 16th century temple of Ajgaibinath Shiva. The river here impinges on a stone cliff. The folklore of river Ganga being seized here by a curse of the sage Jahnu and later getting released by the penance performed by king Bhagirath makes this place an important pilgrimage. The rocky island is known as Jahngira meaning ‘the hill of Jahnu’ derives the name from this historical event. There is a long causeway that connects the mainland with the island rock on which the cluster of shrines is entwined along with the seemingly floating rock. Post lunch visit the temple and moor here for the night. After breakfast we sail towards Munger, one of the largest city and most industrialized cities in the state of Bihar. It is a hub for railway, gun, tobacco and dairy product manufacturing. Its history can be traced back to the mythological era of Ramayana and Mahabharata. In modern times Munger came into prominence in 1762 when the Nawab of Bengal Mir Qasim made Munger his capital instead of Murshidabad in Bengal. The new ruler established arsenal for the manufacture of firearms. Subsequently Munger came in to the hands of the British Empire after Mir Qasim lost the Battle of Buxar. The tradition of manufacturing of arm is continued till now. Post lunch visit the Bihar School of Yoga,a modern school of Yoga founded in 1964 by Satyananda Saraswati and his spiritual successor Niranjanananda Saraswati. In addition to providing spiritual instruction to aspirants, the school also guides yoga projects and medical research in association with various corporations, state government and public works. We disembark the ship at 0700 hrs and drive to visit Nalanda,perhaps the oldest seat of learning in India. It treasures a glorious past, rich spiritual heritage and some extraordinary architectural ruins believed to be established in 5th century BC by the Gupta Kings. Thereafter we drive to Rajgir, the first capital of the Magadha Empire. Buddha not only spent many years in Rajgir, but also delivered important sermons here. Lunch halt at a local restaurant in Rajgir, thereafter continue the journey to Bodhgaya – one of the most important and sacred Buddhist pilgrimage center for the Buddhists. Late afternoon visit the Mahabodhi temple, a UNESCO World Heritage Site. It is a Buddhist temple that marks the location where Siddhartha Gautama, the Buddha, is said to have attained enlightenment under a banyan tree, the “Bodhi Tree”. Buddhist chanting and prayers can be witnessed in the temple premises. After breakfast visit Sarnath [time permitting and depending on the flight timings]. The city is famous as the seat where Lord Buddha gave his first sermon after attaining enlightenment in Bodhgaya. The Archeological Museum at Sarnath contains a large collection of sculptures that stand testimony to the fervent artistic and religious activity for more than a thousand years. Transferred to Delhi International Airport to board flight for Onward Journey. AIR CONDITIONING All cabins are air conditioned with individual units and control panels allowing you to regulate the temperature. All public rooms on the Bengal Ganga are air conditioned.